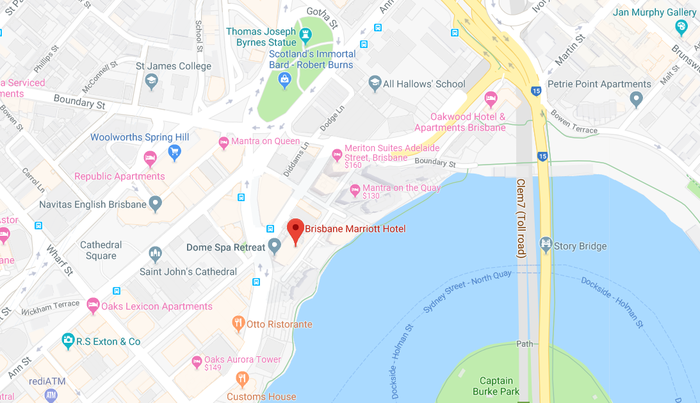 The Brisbane Hotel Marriott is located within the active precinct of Brisbane City, located only 20 minutes from Brisbane Airport. The Brisbane Hotel Marriott complies with regulations and laws governing accessibility and the rights of persons with disabilities. If you have any concerns or require support when onsite then please call +61 420 636 757 for assistance. Leave your car with the Marriott's friendly Concierge team, located on Howard Street who will valet park your car in the hotel. Wilson Parking: 45 Eagle Street, Brisbane. View Website. Secure Parking: Emirates House, 167 to 175 Eagle Street, Brisbane. View Website. Secure Parking:Cathedral Square, 410 Ann Street, Brisbane. View Website. Taxis are available to take you directly from Brisbane Airport to the Brisbane Marriott Hotel. The journey is 14.1km and normally takes around 20 minutes and will cost approximately $45. When leaving Domestic or International Terminal, turn left onto Airport Drive. Travel to the end of Airport Drive and take the Gateway Motorway South ramp, follow and take the Kingsford Smith Drive exit. Follow 'Kingsford Smith Drive' onto Breakfast Creek Rd. Follow Breakfast Creek Rd and it will turn into Ann St. Follow Ann St through Fortitude Valley and turn left into Macrossan St (3rd left after the Big Sandstone Wall on left hand side). Go through one set of lights then turn right into Howard St. The entrance of the Marriott Hotel is approx. 100m on the right.